Twelve Crafts Till Christmas: fawnda's here from fireflies and jellybeans with a reusable snack bag tutorial! fawnda's here from fireflies and jellybeans with a reusable snack bag tutorial! Double blessings today for me! Blessing 1: This is my very first blog swap. Woo hoo! Blessing 2: My very first blog swap is with . . . wait for it . . . Fawnda from Fireflies and Jellybeans. What? What is Fawnda doing hanging out with me? I don't know, and I'm not going to ask her. I'm just going to sit back and enjoy the blessing. If you want to give me a third blessing, pop over and say "HI!" 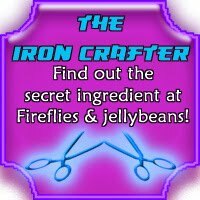 to me at Fireflies & Jellybeans when you get done reading this great tutorial that Fawnda has to share with us today. 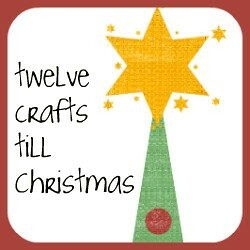 Hello 12 Crafts Till Christmas Readers!! 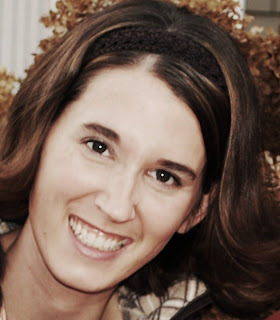 I am so excited to be guest posting here today! Let me introduce myself! I am Fawnda from Fireflies and Jellybeans a little DIY blog that I co-author with my best friend Jeannine. I am a mom to a 2 year old son (who we adopted from Korea about 1.5 years ago!) and a wife to an amazing man! I love all things crafty! We have all kinds of fun stuff going on at Fireflies and Jellybeans! We have a Show Off Your Stuff Party every Thursday where you can link up your posts that you want to show off! 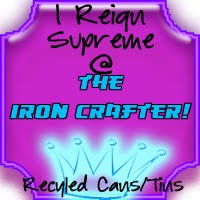 We also have the Iron Crafter Competition, where crafters compete to make projects with a secret ingredient! The 3rd round has been announced... click the button to find out the secret ingredient!! These snack bags will go perfectly with the reusable lunch bag we posted a tutorial for! These bags are great for sending a snack with your son or daughter (or yourself!)! They take the place of zip lock bags so it is a great/cute way to be green! I used the iron-on vinyl again for this project so these bags can be wiped or washed out if needed! 1.) Fold your fabric in half and cut out a rectangle that is 7 X7.5 inches on the fold(the 7 inches should be on the fold). Cut out a rectangle for the liner and the outer fabric. 2.) On the liner fabric, iron-on the vinyl using the packaged instructions to the RIGHT side of the fabric. 3.) Fold your fabric so that the right sides are together and the wrong side is facing out. On the folded edge cut out a square from each corner. the square should be about .5 X .5 inches. 4.) Sew the two vertical sides together on the liner and the outer fabric. I use a 1/4 inch seam allowance. 5.) Square off the corners by pulling the corners of the square apart diagonally so that the seam you just sewed is in the in middle of the edge. 6.) Sew the edge to finish squaring off the corner. Do this to all 4 corners (2 on the liner and 2 on the outer). 7.) Cut out a strip of Velcro that is the length of the side of the bag. Sew the Velcro 1/2 down from the top of the liner (on the vinyl side). Sew the other half of Velcro onto the other half of the liner. So the liner should have Velcro on the vinyl side going all the way around it. 8. Place the liner into the outer fabric right sides together. 9.) Sew around the top of the bag with 1/4 seam allowance. Leave a 2-3 inch opening to flip right side out. 10.) Flip the liner and outer fabrice right side out and push the liner inside the bag. The vinyl is a little stiff so you might have work a bit to get it in. Top sew the opening closed. There you have it! A cute reusable snack bag! I just flip mine inside out and rinse if off once we have used it and let it dry for the next time! Do you like these snack bags, but don't have time to make them? I sell them at my Etsy shop Funky Joy! Check them out! Come on over and check us out at Fireflies and Jellybeans We love to meet new friends! Thanks Fawnda! I'm getting a 5 year old ready for kindergarten, and these reusable bags are PERFECT for all those lunches I'm going to be making for the next decade or so. Hi, I'm here for the first time (I followed Fawnda), and I love the concept! We make a lot (like over 100) Christmas gifts each year as a family, and I like that you're encouraging people to do so. what a fun tutorial and so easy to follow. Can't wait to try this. I line my bags with cotton and just run them through the washer. I've also used rip-stop nylon in a few bags for "wet" snacks. I am glad that everyone likes the tutorial. Mama Mama Quite Contrary - On the Vinyl it does say that it is OK to use with food; It may be a byproduct of Vinyl that is not toxic. It looks like your report is from 2004 and this product is newer so HOPEFULLY they are not lying to me by saying it is OK to use with food! I have also used PUL fabric (Polyurethane Laminate- Sold at Joann) that also claims to be safe to use with food. It works similar to the Vinyl and wipes clean. As Elizabeth would say: Craft ON! Hi Elizabeth! Just dropping in to see what you've been up to - WOW!! Almost 400 followers!!! Good for you!!! Rock on, girl!! 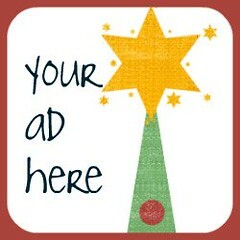 Have you seen my new blog button @ Ten Thousand Hugs?? If you need any buttons to feature and mine fits the bill, I would love to be featured on your Button Mondays!! As always, your blog inspires me to no end!!! Have a great weekend!!! Fawnda, your packaging is probably lying. Lead is used as a stabalizer in soft plastics like vinyl. Unfortunately, it isn't really compatible with the plastic, so the lead migrates to the surface and leaches out. Anytime you or your child puts a hand in the bag, you will almost certainly have lead dust on your skin. The food will too. Your package is likely marked "food safe" because it may not meet the high criteria for lead exposure but as a known neurotoxin, there is no safe amount. (Plus enforcement and testing on packaging claims like this sort of thing are notoriously lax.) With repeated use, the exposure mounts over time. The FDA recalled vinyl lunchboxes in 2006 because of the lead in the vinyl. Vinyl-coated bibs were also recalled not that long ago. I don't want to belabor the point but I am sure as a mother, you and many of your readers would want to know this. pics of me - they say it's my birthday . . .
more soda can jewelry? ugh!